We plan and conduct a wide variety of tours - to suit your interests,budget and time. You can choose from the standard list of tours, or make a request towards your personal interests and we will make an itinerary to suit your needs. All our tours depart and return to your cruise ship and include entrance tickets,licensed expert guide and air-conditioned vehicle,predominantly Mercedes. 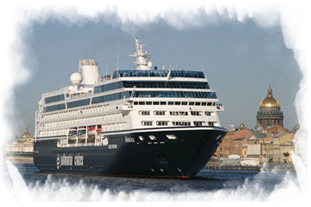 Please note: we have an agreement with St.Petersburg passenger port,which allows us to issue clearance to leave the port "VISA FREE" for any passengers booking a tour through our company. Have only one day to spend and want to cover the highlights? Enjoy your shore excursion with an experienced guide.. If you have two days to spend in St.Petersburg,let us show you around all city highlights and experience the most breathtaking palaces outside the city..
Three days in our beautiful city is enough time to see all the highlights and then much more... Maximize your time in the city with a local expert and learn more about city's history and culture.. If you come by a cruise ship and stay in St.Petersburg for 3 days you could make a one-day tour to Moscow, the capital of Russia.. Copyright © 2012-2019. Tailored Tours St.Petersburg.